The kids are back in school, and motorists are reminded to pay extra attention to those school safety signs as well as general school traffic signs. Drivers need to be alert and be on the lookout for pedestrians of every age especially children. Young school-aged children may still be learning about roadway safety rules and boundaries. As such they may not fully appreciate the dangers that moving vehicles can pose. 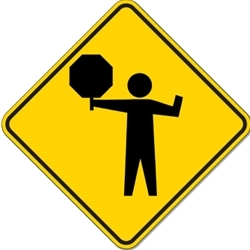 School zone signs can help drivers be aware that they are entering an environment where large numbers of young children and adults may be walking outside on a sidewalk and crossing the street. Unfortunately automobile crashes are the leading cause of death for children ages 3-14, and school zone sign safety can help increase driver awareness and possible reduce the number of accidents. Children themselves are often not the best judge of the speed of passing vehicles. They may not be able to make the best decision regarding when to go into the road either to cross it or to retrieve a ball or other toy. As such, drivers need to be on the lookout for them and visible school traffic signs can help drivers do just that. Drivers are encouraged to reduce their speed when driving in the vicinity of a school. It is worth noting that motorists’ speed has a significant effect on an accident’s fatality, which is why minding slow down signs is so important. School crossing signs at busy intersections help children and all pedestrians cross the road safely. Many schools now use crossing guards with hand held stop signs to help better improve overall safety. When children have a designated spot to cross the street, they can form good, safe habits for crossing the road in general. Such school zone traffic signs help motorists as well by giving them a specific spot to stop and look around for pedestrians. Paired with public education programs that help children learn how to look both ways before crossing the street, these crossing signs tell them where to cross instead of just how to do it.